For those with caffeine sensitivity or high consumption levels of green tea, there may be some caffeine side effects. In general, green tea has less caffeine than other tea types. However, some types of green tea (such as matcha green tea) can have more caffeine than your typical black tea or even espresso. However, excessive consumption of green tea can cause restlessness, heart palpitations, difficulty sleeping, anxiety, irritability, increased heart rate and elevated blood pressure. People with caffeine sensitivity are more susceptible to these side effects. The good news is that you can easily reduce these side effects by drinking less green tea, drinking a different type of green tea, drinking decaf green tea or brewing your tea less strong. Many people also find that switching from teabags to loose leaf tea makes a big difference in their caffeine jitters. Also, it's worth noting that green tea has a natural chemical called theanine, which has a calming effect on the brain and reduces these effects of the caffeine. Like other tea types, green tea contains tannins. Tannins are a naturally occurring chemical which stimulates the stomach to secrete more acid. If you have a peptic ulcer or an acid reflux problem, green tea can cause stomach upsets or nausea. If you have diarrhea, tannins can also worsen it. You can reduce or even eliminate this side effect by consuming green tea after a meal or merely when your stomach isn't completely empty (i.e., first thing in the morning). It's also worth noting that green tea is much lower in tannins than most tea types and that it usually causes far fewer stomach problems than coffee. The tannins in green tea (and other tea types) may prevent the blood from absorbing certain nutrients, particularly non-heme iron. Studies have shown that excessive consumption of green tea may reduce absorption by up to 25 percent. The good news is that you can counteract this side effect in a simple and delicious way (adding a slice of lemon to your tea) or by only consuming green tea thirty minutes before or a couple hours after you eat a meal. Green tea is commonly consumed during pregnancy in Japan and China, and it is recognized as being generally safe to drink it then. However, some doctors advise against consuming any form of caffeine in the early months of pregnancy, because studies have linked excess intake of caffeine to neural birth defects. To mitigate these potential side effects, you can reduce green tea consumption or select green teas that are lower in caffeine. 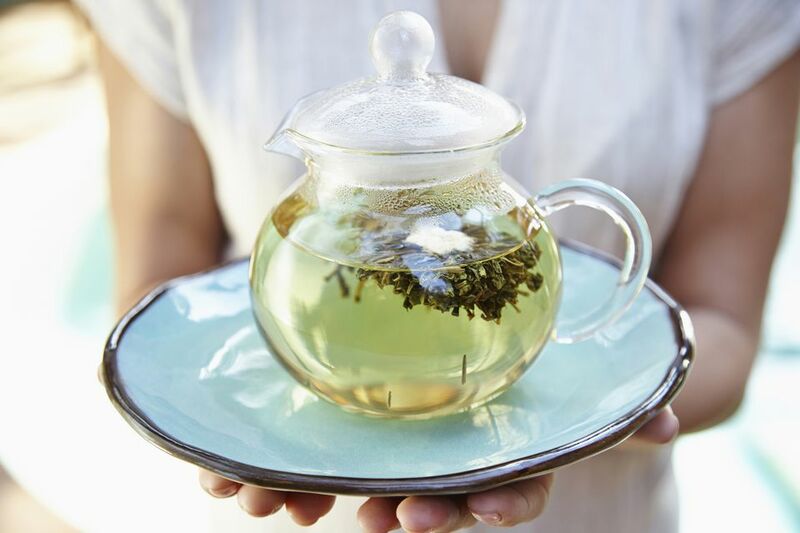 Like so many other things, green tea can interfere with certain medications. If you have any questions about combining green tea with your medication, consult a doctor or your drug's maker. When in doubt, you can also time your green tea consumption so that it is a few hours before and after when you take your medicine. Some studies show that drinking green tea may increase the amount of calcium that is flushed out of the body with urine. However, it appears that this only occurs in cases where people are consuming more than 400 mg of caffeine (about four to five cups of green tea) per day and that any side effects can be reduced by taking calcium supplements or eating a diet rich in calcium. If you are experiencing green tea side effects, talk with a doctor and consider reducing or eliminating green tea in your diet. Also, see the recommendations for specific side effects listed in each section above. Is Drinking Green Tea Worth the Risk? Green tea's side effects are very rare and are usually only experienced in cases where a person who is consuming large amounts of green tea already has a medical condition in play. In general, the health benefits of drinking green tea (especially organic green tea) far outweigh the risks.